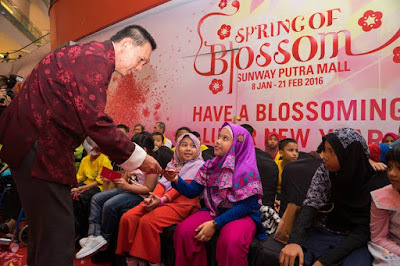 It is a time for celebration at Sunway Putra Mall as brilliant red cherry blossoms have sprung forth in the main atrium, signifying the start of the Lunar New Year celebrations. 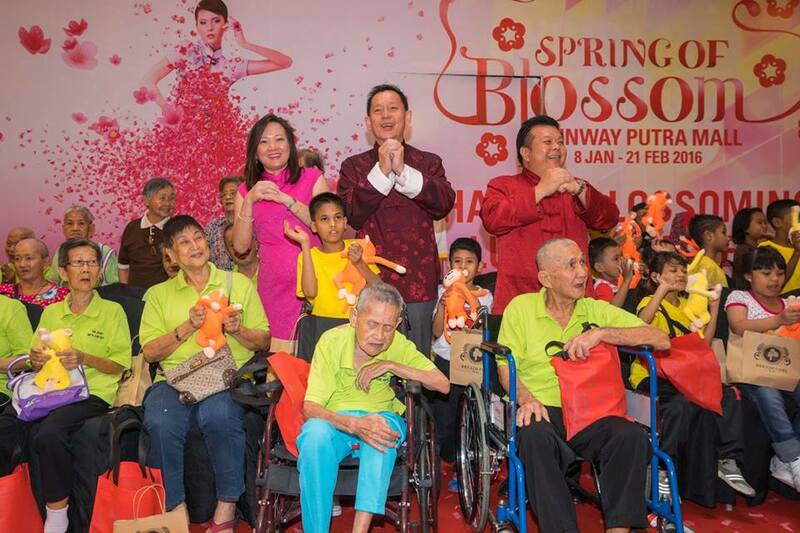 In the spirit of the festive season, 30 children from Yayasan Chow Kit (YCK) and 22 senior citizens from the Siri Jayanti Metta Care Centre and Persatuan Kebajikan dan Sosial Kim Loo Ting Nursing Homes, were invited to join the Lunar New Year Launch at Sunway Putra Mall. 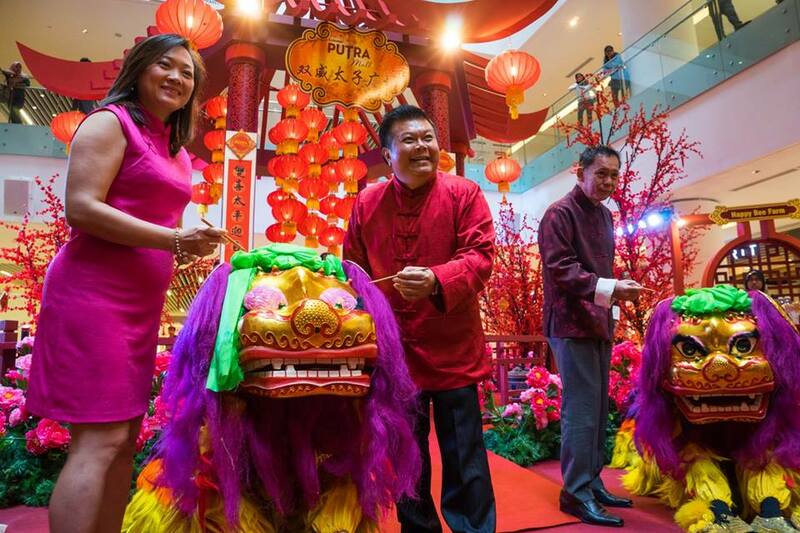 This is the mall’s first Lunar New Year celebration since their opening in May 2015. 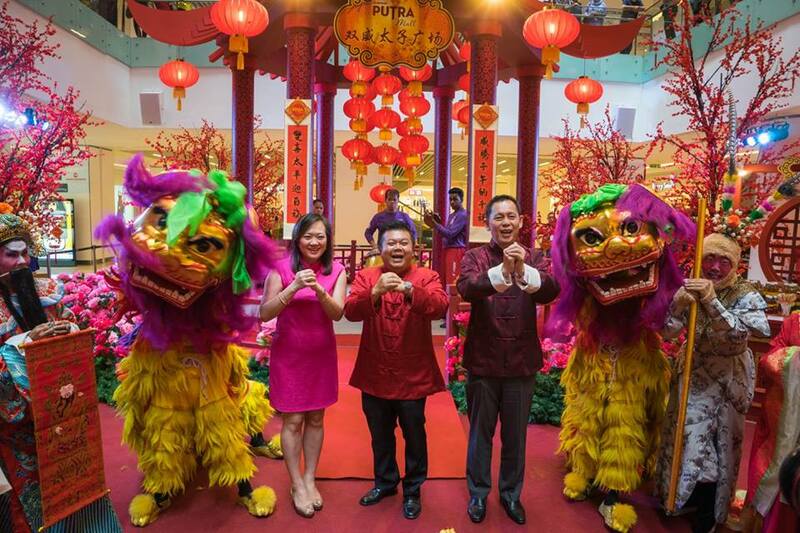 The launch was officiated by Mr HC Chan, Chief Executive Officer of Sunway Shopping Malls and Theme Parks. 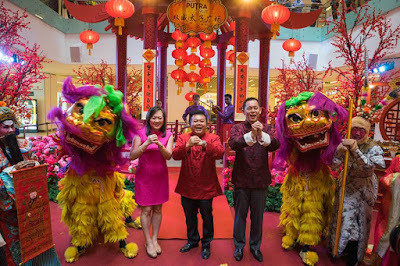 Also present were Mr Kevin Tan, Chief Operating Officer of Sunway Shopping Malls and Ms Phang Sau Lian, General Manager of Sunway Putra Mall. 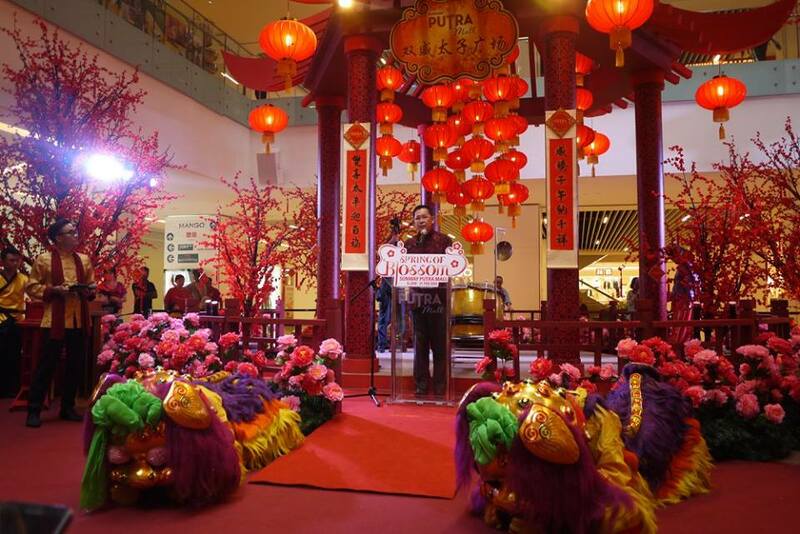 Speaking at the launch, Mr HC Chan said “This Lunar New Year launch is the last leg of the long list of celebrations that began with Raya, Deepavali and Christmas. We at Sunway make it a point to celebrate national celebrations together and more importantly, celebrate the spirit of togetherness. We would like to take this opportunity to wish everyone Happy Lunar New Year and Gong Xi Fa Cai,” said Mr Chan. To mark the special occasion, Mr Chan, Mr Tan and Ms Phang performed a special eye-dotting ceremony. Just as they were about to paint the eyes on the slumbering lions, the Monkey King and God of Fortune made a grand entrance and proceeded to accompany the VIPs as they dotted the eyes of the lion. Moments after the lion’s eyes were dotted, the two mythical creatures came to life accompanied by the sound of thundering drums and proceeded to thrill the crowd by demonstrating their skillful movements. Mid-way through the performance, one of the lions consumed a pomelo, a symbol of good luck, held by Mr Chan, and presented a neatly peeled fruit in the shape of a flower moments later. At the climax of the lion dance, a red scroll was presented to Mr Tan. 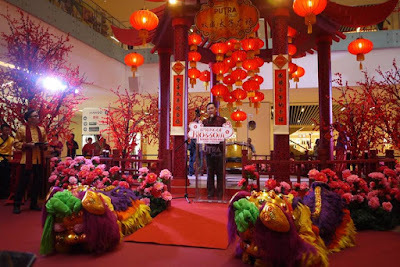 When unraveled the scroll revealed the auspicious message “May Sunway Putra Mall shine and have success all year long” followed by the bursting of confetti and lighting of a fire fountain. Following the magnificent lion dance performance, Mr Chan proceeded to give angpaos followed by Mr Tan and Ms Phang who handed out goodie bags, which were specially sponsored by Cold Storage and Bread Story, to the children of YCK and senior citizens as a show of Sunway’s support for these institutions and to brighten up their day. The final performance of the day consisted of the traditional Chinese dance performance of the Long Sleeve and Silk Ribbon Dance before the attendees were ushered to Selera Street food hall for a special Yee Sang tossing celebration. 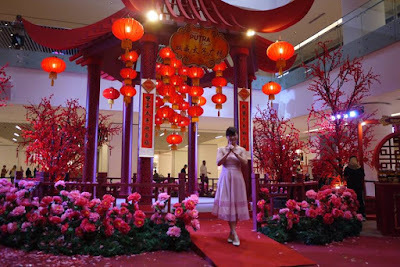 The launch continued with the appearance of the God of Fortune and Happy God who gave out mandarin oranges to the guests. Located at 4th floor, the aptly named Selera Street is the central food hub of Sunway Putra Mall offering mouth-watering food selections that range from Boat Noodle, Teochew Chendol, SS2 Pisang Goreng and many others. From now until 21st February 2016, shoppers will be enchanted by a completely red concourse where a majestic pagoda stands among the red cherry blossoms. Get your New Year essentials at the Spring Flower Market and Lunar New Year bazaar, happening at the Main Atrium, Ground Floor or browse through the various festive offerings in the mall. In the spirit of spreading wealth and prosperity, Sunway Putra Mall has attractive redemptions spread across 3-tiers to be offered to shoppers. 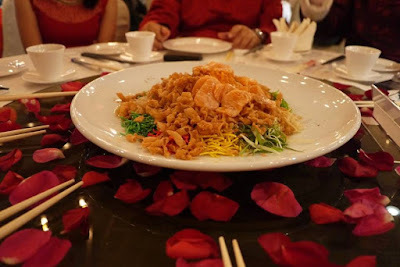 Shoppers who spend RM200 in 3 receipts, they can redeem 2 sets (3 sets for HSBC, the official bank partner of Sunway Putra Mall, cardholders and Sunway Pals members) of Prosperity Red Packets. As it is The Year of the Monkey, Sunway Putra Mall’s next redemption tier features an adorable Monkey Plush Toy for shoppers who spend more than RM600 (RM500 for HSBC cardholders and Sunway Pals members) in 3 receipts. 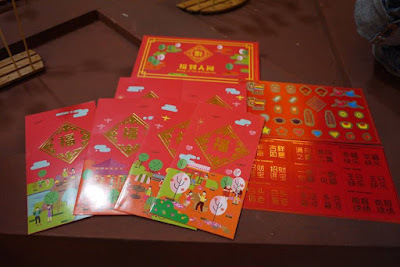 Finally, spenders of RM1,500 (RM1,300 for HSBC cardholders and Sunway Pals members) will take home a Wah Chan Golden Monkey Pendant or a Poh Kong Gold Trinket. Apart from that, the mall has organized several performances and activities to entertain shoppers during the festive season. 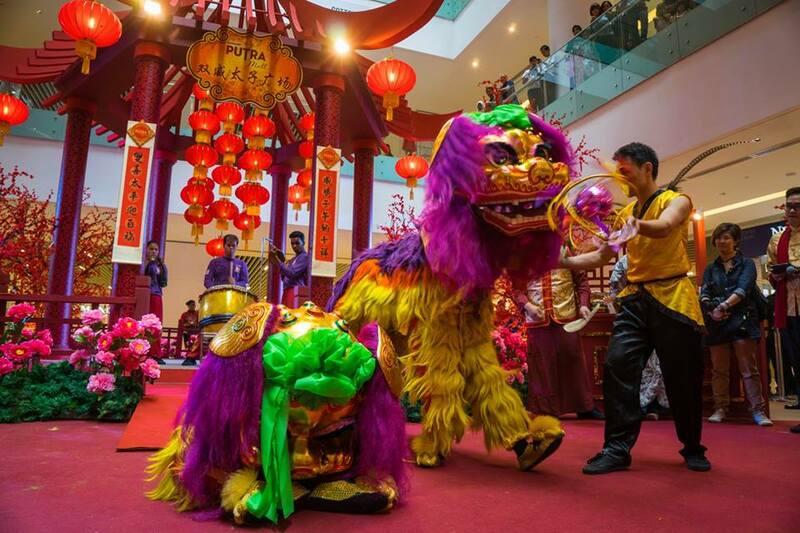 Shoppers can be thrilled by the amazing Northern Lion Dance and traditional Chinese dance performances and even try their hand at the flower arrangement workshop and take home their creation. Lucky shoppers may even get to meet the God of Fortune when walking around the mall and receive an angpao and mandarin oranges from him. 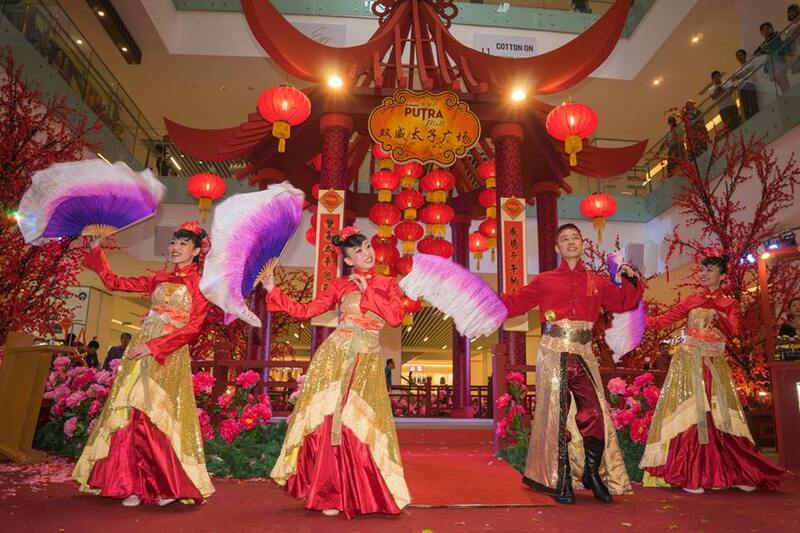 So come together with family and friends and get into the festive spirit this Lunar New Year at Sunway Putra Mall from now till 21st February 2016. For more information please contact 03-2786 9333 or log onto www.sunwayputramall.com for details.